Chris Thile performing solo in London at the Borderline, September 13, 2011 with Loar #75316. Photo credit: Dan Beimborn. Chris Thile has been very busy, riding a wave of creativity and musical output that has no match in the mandolin world. His recent work spans diverse genres: traditional "brother duet" singing with Michael Daves, classical music with Yo-Yo Ma in The Goat Rodeo Sessions, and creating new acoustic music with the Punch Brothers. We caught up with Chris on January 23 in Shepherd's Bush, following a packed and energetic gig in London's Bush Hall. We talked about recent recordings, upcoming projects, and his recently acquired Lloyd Loar F5 Mandolin. Chris, an avid mixologist, likens his recent musical output to a cocktail made up of three different flavors. Dan Beimborn: You've been very prolific lately. Three recordings in very different genres in the last six months. Chris Thile: One of my favorite cocktails in the whole world is the Negroni, which is equal parts Gin, Campari, and Sweet Vermouth. The record I made with Michael Daves is the Gin. BAM, a simple crisp kick in the head. The Punch Brothers is like the Campari, balanced with bitter & sweet. The Goat Rodeo Session is the Sweet Vermouth, very refined, delicate. Those three records are the Negroni of my musical life this year. Dan Beimborn: You've also mentioned a solo Bach recording recently? Chris Thile: I'm getting very close to recording the Bach. I think that could happen some time this year, maybe the end of this year. Dan Beimborn: Are you planning to play mandolas and mandocellos as well as your mandolin? Chris Thile: Just mandolin. I don't very often play other instruments. With the Goat Rodeo project I played some fiddle & guitar in addition to mandolin. Newest from Chris is Who's Feeling Young Now, available February 14, 2012. Chris is joined by fellow Punch Brothers Noam Pikelny, Gabe Witcher, Paul Kowert, and Chris Eldrdidge. The instrumentation follows a traditional bluegrass band, but Chris is quick to point out that they are using this lineup to create new music. The way this is recorded has changed, from a very organic "live session recording" feel on previous outings to a well-produced mixture of tones that add a lot of life to Chris' vocals. Punch Brothers' forthcoming album, Who's Feeling Young Now?, is due out February 14 on Nonesuch Records and is available for pre-ordering. Get it from: Punch Brothers | amazon.com. Dan Beimborn: We've listened to an advance copy of Who's Feeling Young Now. We noticed a very big change in production, much more vocal presence, different mixing. Can you tell me about the production? Chris Thile: Jacquire King produced it this time. We were going for a more involved relationship between band and studio. I think they (previous producers) approached us as sort of an "opportunity to flex their organic chops," to say "oh wow, these guys play live... they can cut all their parts, and I'm just going to throw up a couple mikes and off we go." So even a producer like John Brion, who is known for having an innovative approach to the studio, getting wonderful bizarre sounds out of things, approached it as an opportunity to capture sound in a very natural, representative way... as opposed to allowing the studio to become a sixth band member. I think this has been appropriate on the last couple of records, but this batch of material, I think, the boys and I have become more and more interested in being an ensemble of musicians that play these instruments that are associated with the music of the past. But creating music that is very present, that has an eye towards the future instead of towards the past. Dan Beimborn: I noticed the crowd at Bush Hall was very young, I was expecting to see more fogeys. Chris Thile: It's very nice, we're starting to get a nice balance. I feel like it's important to be making new music, and I feel like the energy behind this material is best heard through the sort of filter that Jacquire was providing. A little bit more electricity behind it. He understood the intent behind the performance was not curative, it wasn't trying to present something that happened long ago. When it comes to acoustic bands, it seems like there are so many "music museums" out there, and we don't want to be a music museum. Chris Thile: Right. We play those instruments, because that's what we know how to play best. We are trying to do something new. Jacquire got in there with us, he was the sixth band member. He played the studio like an instrument and really helped us to accurately represent the intent behind the songs. Both in their construction and delivery. Dan Beimborn: The results are very nice. Great instrument sounds, vocal presence, a very nice total result. Chris Thile: Thank you. We had so much fun. You know, we could hear all of those sounds in the headphones as we were recording. We were committing to sounds. It wasn't just like you record acoustically and slap a bunch of stuff on it it. The instruments were being "re-amplified." He was sending the mic feeds through amplifiers, recording those in addition to the beautiful mic sounds that we had. There would be an array of microphones in front of each guy, and some of these were going directly into these beautiful old amplifiers, killer effects, old pedals, things like that. The effects you are hearing are what we were playing to in the cans, instead of this pristine acoustic sound. On to gear. Chris plays Gibson F5 mandolin #75316, signed by Lloyd Loar on February 18, 1924. Lloyd Loar's personal F5 precedes Chris' by one serial number. Personal experience with Loar signed mandolins has been very positive for us, and we were very interested to hear his perspective and find out what new directions the Loar was taking him. Dan Beimborn: My wife commented to me during the performance that she was amazed at how many different sounds you were getting from the mandolin. Has the Loar changed anything for you? Any new direction as a result of this instrument? Chris Thile: ABSOLUTELY! That mandolin has so much life in it. It has a lot more "high end information" than my last mandolin did. The last mandolin had this beautiful... (it's not dead! it still has it!) this beautiful woody low end, low mids, but then it started to fall off high-mids and highs, so where the high end... the only information up there was really referring back to the low end, and then it was just pick against the string. Not a super-pleasant kind of sound. As opposed to the wood having a high-end character of its own. This mandolin has less information in the low end, but it's really balanced across the spectrum. This is really, really nice for me. I'm always climbing it, and falling all the time. Gibson F5 mandolin #75316 was purchased new by Virgil Bisagno, a member of Fisher's Gibson Orchestra of El Dorado, Kansas. The images that follow came with the mandolin. The orchestra picture below also appeared in Gibson catalog P, 1928 (presumed), Page 8. EDITOR'S NOTE: the Mandolin Cafe has been in contact with musician friends in El Dorado, the Butler County History Center of El Dorado, and great-grandchildren of orchestra leader Howard D. Fisher seeking additional for this interview. While this information will eventually come to light, it did not in time for this interview and will be made available when it does. From an article by Steven Stone for Vintage Guitar Magazine (linked at bottom of article). Thile's recounting of the story of the mandolin was as follows: "... an 18-year-old senior in high school bought it new in 1924, played it in a mandolin orchestra for a year, then married his high school sweetheart. On his wedding night, he put it under his bed and never played it again. White (Crawford White of NashvilleVintage.com) bought it from his 98-year-old widow. So I played it and right away I could tell it already had some of the characteristics I wanted a Loar to have." Virgil Bisagno, the original owner of Chris Thile's mandolin appears as a member of Fisher's Gibson Orchestra of El Dorado, Kansas in the third row, third from left, pictured below. "Howard D. Fisher was born on 15 Apr 1885 in Wilson County, Kansas. He married Mattie Hazel Brown about 1906 and they were the parents of two daughters, one of whom died in infancy. Fisher tried his hand at many occupations in his life, by turns he was a barber, farmer and music teacher. He lived in Wilson, Neosho and Lyon Counties before finally coming to El Dorado, Kansas in the early 1920s. He lived there at 131 Vine Street for almost a decade, working first as a barber and then by 1930 as a full-time private music teacher. He was the leader of Fisher's Gibson Orchestra by 1924, a mandolin-guitar-banjo band. He likely dealt directly with Gibson through his barbershop, a paradigm which was successful for Gibson more often in the south. He died during December, 1970 at Emporia, in Lyon County, Kansas." We couldn't resist an attempt at identifying all of the instruments in the orchestra picture with Joe Spann's input. Like to try yourself? Here's the original orchestra image at 150 dpi, un-retouched and an enhanced 1800 pixel wide version gray scaled for better contrast. Dan Beimborn: I've noticed you're not afraid of the dusty end of the fretboard. Chris Thile: Right! No, not so much! It's a beautiful action. The more I play it, the more low end comes out. Anyone who tells you that a mandolin doesn't change as you play it has no idea what they are talking about. Dan Beimborn: Can you tell us the story behind the Loar? Did you try several before you found "the one?" Chris Thile: I tried a bunch. I think I played 11 or 12 before I found mine. All of the Loars I have loved the most have been February 18s. That batch. Chris Thile: Right, Mike Marshall's, John Reischman's is February 18, John Paul Jones'. Dan Beimborn: Was John Paul's Loar the second mandolin you had at the London Borderline gig (September 13, 2011)? Chris Thile: Yes, exactly. So those are just spectacular instruments. This one is a February 18. It was sleepy. It literally hadn't been played since 1924. But I could hear some of what it was going to become in it. As if under water or something! I decided to take the chance on it, and it's proven to be well worth it. It's a GREAT instrument. Left: #75316 belonging to Chris Thile. Right, #75317 belong to John Paul Jones. Photo credit: Chris Thile. Dan Beimborn: Sure sounds like you got a good one. Chris Thile: I feel really lucky. To me definitely sounds like a top 5 in the world kind of instrument. Dan Beimborn: Sometimes it's easy to tell a bad mandolin, though the really great ones often are subtle, it takes a couple hours to really hear it. Chris Thile: Exactly. The great ones don't kill you with any one characteristic right away. Dan Beimborn: So much is down to set-up and maintenance too. Was it Lynn Dudenbostel who did the set-up for you on the Loar? 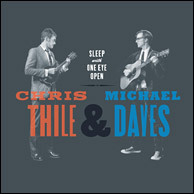 Chris Thile & Michael Daves - Sleep with One Eye Open on Nonesuch Records, from 2011. Click to purchase. Chris Thile: It was a combination. Steve Gilchrist did the initial work. There was a crack, a couple standard things that happen to Loars that live strung up for a long time without being played. There was a little crack right by the extension on the bass side, and a little separating by the back & sides towards the south point. One little tiny crack right on top of that, right on the bass side of that south point. Those are all very standard things that happen. It's separating a little bit now between the back and that same spot. So I'm going to have to get it repaired at some point. But you know, that's what happens when you tour with it. I would advise anyone who has a Loar — take the thing out of the ***damn case! It is NOT a museum piece, it is an instrument. It is an instrument that needs to be played. If you're not playing it, find someone who will and loan it to them. Let them play it. It's like how sad it is to see a cheetah in a zoo. It makes me SO MAD. Anyone that ever looks at mine and says "Oh man, you put some scratches on it, eh? " ... **** OFF. It drives me absolutely crazy that people baby these things. I mean, by all means, take care of it, make sure it doesn't get stolen, that kind of thing. Keep it out of harm's way, but PLAY IT. Tour with it! Make music on that thing, it's dying to be played. They are such brilliant instruments. AND — get it in playable condition... take the fingerboard off. The jig in the factory was WRONG. if you keep the thing in original condition, it's not playable! The frets up on the top end are out of tune! It drives me to distraction that people who deify these things and don't get them in playable condition and play them. They are brilliant instruments. Loar was not God. He was a very good instrument builder. Sorry. It's a little rant. "Play your Loar." I'm just going to go ahead and say keeping it original is keeping it wrong. Hey, if that's what you like... more power to ya. We closed with a few questions on equipment and set-up: we were quite impressed with the live sound Chris had from the Loar, as well as more powerful mandolin tone we heard on the night of the gig, so we were curious to hear details behind the changes in the sound we were hearing. Dan Beimborn: On the subject of gear, your stage mandolin sound was very nice. What sort of pickups/lines were you using? 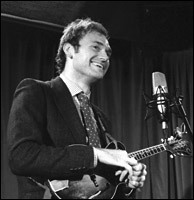 Chris Thile: I use an ATM-35 microphone Audio Technica clip-on microphone, not a contact mic. It's a little microphone that clips onto the arm rest, a little clamp clips on to the microphone and goes over the sound-hole. Dan Beimborn: Does it go inside one of the F-holes? 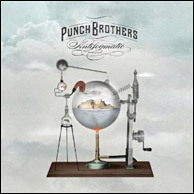 Punch Brothers 2010 release Antifogmatic, on Nonesuch Records. Click to purchase. Chris Thile: No, it's on the outside, over the treble hole. It clips on the arm rest, and it's on a little goose-neck. The microphone is about 1 1/2-2" above the treble F-hole. Dan Beimborn: Scott mentioned to me that you've been raising your action over time. Chris Thile: Yes, I've definitely gone higher. My hands are stronger than they used to be. I kept hearing tapes of myself, where in the heat of battle, I would be over-driving the instrument all the time. Snapping, buzzing... I decided that I was sacrificing tone for facility. Facility means nothing if it doesn't sound any good. So I've cranked the action up a fair amount over the last 3 or 4 years. I think I've finally found the place, where I can still play the most demanding stuff like the double from the second movement of the B minor partita for instance. Playing that where it needs to go as the double of the second movement, you don't want to take the first part too slow, they need to be the same speed. That puts the double at like 160/165. That's really fast and hard to sustain that sort of speed through the whole thing and keep it clear. I've always had that where I think "I shouldn't crank my action up where I can't make it through that piece." Dan Beimborn: So that's the limit. Chris Thile: I've had it higher with Punch Brothers, to make sure that I'm not over-driving the instrument. I still do sometimes. I'm working on that, it's a huge problem with my playing — getting too excited and playing too hard. Chris Thile: Yes! I get too excited live and want to bring it home. I lock up my mechanism (points to his right arm), and overdrive the instrument. It's not a good sound and it doesn't help you convey the intensity of your experience. That's the biggest thing I'm working on right now, playing the way I play in the heat of the moment and not trying to get too much out of the instrument. Our time together, though brief, suddenly came to an end. Chris was spending the good part of the day dealing with pre-scheduled blocks of interviews (a "press day" as they called it) and was now on to his next interview with the Punch Brothers after a reminder from his tour manager. Like a perfectly crafted Thile solo that takes you to unexpected places, we were sorry to see it end.